As one of the media sponsors of Maker Faire Bay Area 2008, I have a some extra tickets for this weekend’s event, so we’re going to give away a few pairs of tickets via Twitter. I’ll be announcing the ticket giveaway on our Laughing Squid Twitter account, so you’ll need to subscribe to it in order to see the announcements. If you were one of the winners, please email us your mailing address so we can mail out your tickets. Due to the last minute nature of this, we are only giving away tickets to people who live in the Bay Area. We will need your mailing address by 1pm PDT on Wednesday, April 30th in order to send you your tickets. 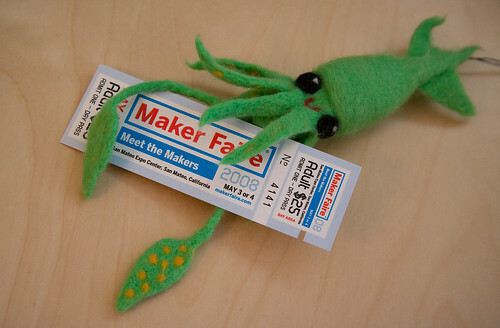 If you weren’t a recipient of one of the free tickets, you can always buy your tickets in advance online, which can then be picked up at the Maker Faire Will Call. Maker Faire Bay Area 2008 takes place this Saturday, May 3rd and Sunday, May 4th at the San Mateo Expo Center. See my previous post for more info. Round #1: The current time is 6:25pm PDT on Tuesday, April 29th. I’m going to give a pair of one-day Maker Faire tickets to next three people who leave comments on this post. I’ll contact the winners for their mailing address so I can send the tickets via US Mail. Again, please remember that I’m only giving away tickets to people who live in the Bay Area. Round #2: The current time is 6:25pm PDT on Wednesday, April 30th. I’m going to give a pair of one-day Maker Faire tickets to next next person who leaves a comment on this post. I’ll contact the winner for their mailing address so I can send the tickets via US Mail. Again, please remember that I’m only giving away tickets to people who live in the Bay Area. UPDATE: Thanks for playing everyone, all Maker Faire tickets have been given away.